The Turkish Van cat is also known simply as a "Van cat." It has several characteristics that make it an unusual and unique feline, and there are many reasons you may want to own this unique breed. The Van has a love of water and swimming that makes it different from most cats. The breed is native to the Lake Van area of Turkey, so visitors there will often find the cats swimming in the shallow areas of the lake. This love of water doesn't stop at swimming, however. The Van happily plays in sinks and toilets, and will add toys, socks and other items to her water dish. It is a good idea to keep the lid down on the toilet for safety's sake if you have one of these water-loving pets. Although Turkish Vans are very affectionate and bond strongly to one person in particular, they also have an independent streak. This is not a cat that will enjoy being carried around and forced to be still. She wants to do what she wants to do, and all the better if her favorite human joins her in the activity. These cats stay energetic and kitten-like well into old age; chasing wadded up paper or batting around balls that you throw for them. A Van is a gifted climber, so you will want to make sure that you provide a cat tree for your pet to keep her from choosing to perch on the top of your best curtains. You may find her on the top of the door, tall armoires and other places where she can survey the world from above. Turkish Vans are described by their owners are being more like a dog than a cat. They often can be persuaded to walk on leashes, and they get along well with other household pets as long as they remain the boss. These cats are good with children and make excellent pets for a family. The Van's fur is water resistant and has a texture that has been compared to cashmere. The lack of undercoat keeps the long fur from matting. This is one long-haired cat that you won't have to spend a lot of time grooming. The body is lean and muscular with a broad chest. The tail is short and very full, almost plumed with rings of color around it. The pads of the paws are always light pink, as is the nose. Some people confuse the Van with the Turkish Angora, but the latter has a more delicate look and bone structure. 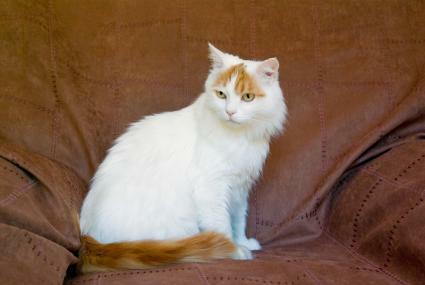 Turkish Van cats may have amber or blue eyes. Some cats even have one of each which gives them an even more unique look. This is an ancient breed of cat. In fact, the first record of these felines seems to be carvings on ancient Hittite jewelry, seals and decorations. The Roman legion adopted the images and used them on their shields and standards. Folk songs from the Middle Ages mention swimming cats, and references to the cat are found in common Armenian proverbs and sayings. Vans were not available outside Turkey until the mid 1900s when two women, traveling in the Lake Van area, saw cats swimming in the lake. They were intrigued and took two of the cats back home to England and began a breeding program for the Turkish Van. The breed was recognized formally in 1969 and accepted into all major cat breeders associations and clubs by 1988. It can be difficult to find a good breeder for any type of cat. Be sure to get references and talk to people who have purchased animals from the breeder in the past. Read and discuss guarantees and return policies so that you know what to expect if there is a problem. You may be able to locate a breeder near you on the Fanciers Breeder Referral List. Most breeders will explain that buying a pet is a lifetime commitment. If you want a cat that is unique and lovable, a Turkish Van is a good choice.